The Ekesparre B&B, the building at right, reflected in the moat that surrounds the medieval castle in Kuressaare on the island of Saaremaa. A castle tower, at left, also is reflected in the moat. KURESSAARE, Estonia — This small Baltic nation counts 1,521 islands. I visited two, Saaremaa, the largest, and neighboring Muhu. A bridge links the pair, and each is connected to the mainland with regular ferry services. I was a guest, with other press, of the Estonian Tourist Board. 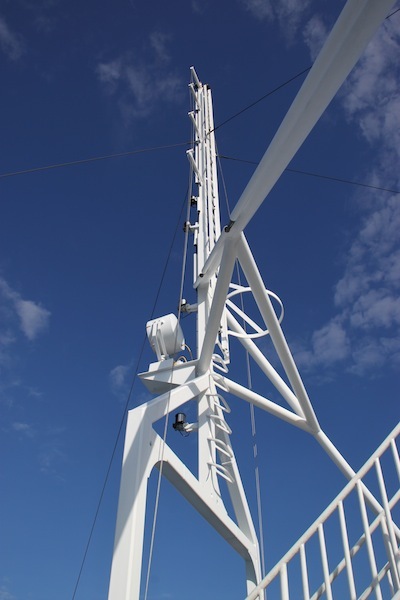 Part of the gear on the ferry to Muhu, appearing here simply because it made a good photo. This excursion began with the Virtsu-to-Muhu ferry, a 23-minute ride across the clear blue Baltic, in brisk (read, windy and chilly) air but under a bright September sun. 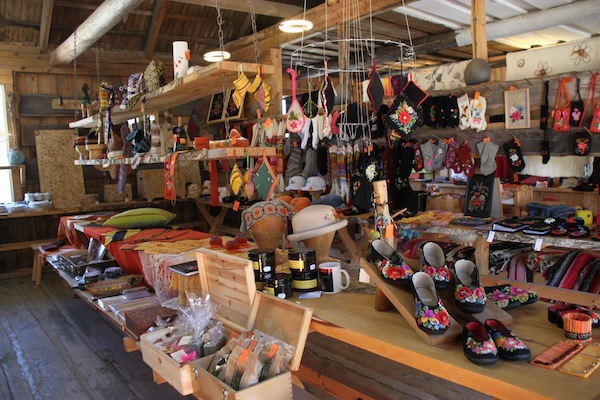 • Shopping in Liiva, a center for Muhu handicrafts, especially goods made with juniper wood. The big item is the butter knife. I have several now, some for gifts. Many souvenirs here are juniper because juniper is richly available on these islands, although protected elsewhere in Europe. 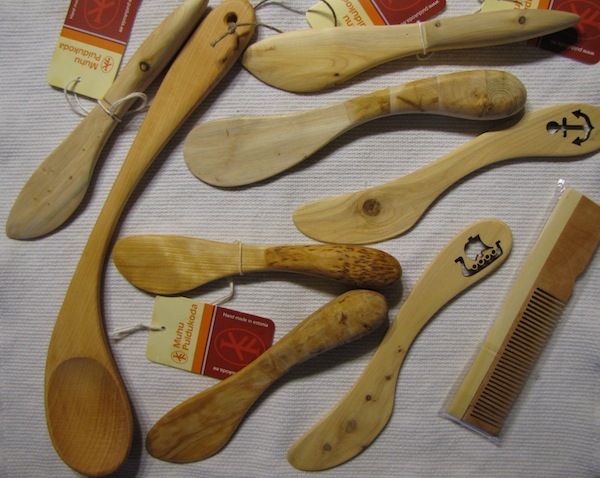 Samples of various juniper butter knives, with a wooden spoon and comb, both also of juniper, thrown in. Another souvenir was colorful knitted socks in huge sizes for men. We wondered, do Estonian men really have such big feet? We were told yes. Goods seen in a Liiva souvenir shop, on Estonia’s island of Muhu. • Lunch at Nautse Mihkli guesthouse, which is a repurposed set of farm buildings. The main structure originated as a house/barn combo more than 100 years ago. The former house/barn combination that is now the main house of the Nautse Mihkli guesthouse on Estonia’s island of Muhu. Our hostess, Ingrem Raidjoe, and her husband own the business. The guesthouse accommodates 30 people in summer (many in a detached building with multiple singe beds, in a setting resembling summer camp) and 12 in winter, but only in the main house. Ingrem Raidjoe, who teaches cooking classes at the Nautse Mihkli guesthouse that she and her husband operate on Muhu island. 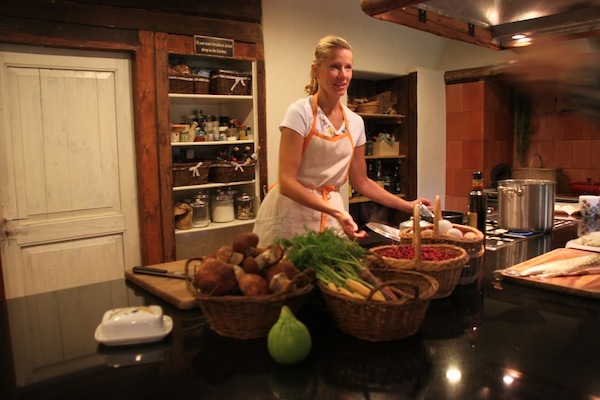 Tourists can book rooms, meals and/or cooking classes on line. Ingrem teaches the classes, specializing in ostrich (raised on Muhu) and wild game, meaning red buck (she and her husband hunt). Lunch was mushroom quiche (way better than I expected), red buck, beet cake and beet ice cream. Our visit included a folk dance program. 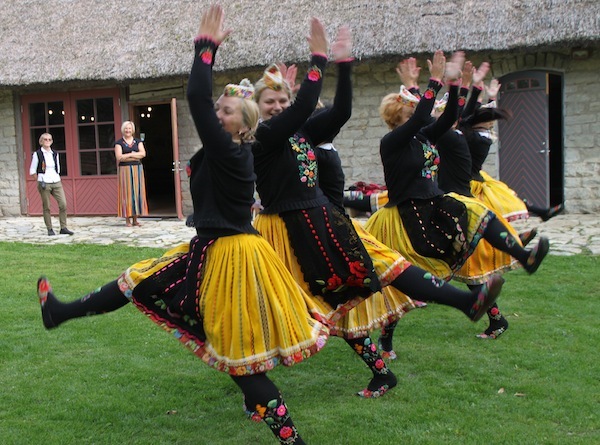 Muhu is renowned for the dancing, which resembled square dancing/circle dances/polka. The accompanying accordion music included pieces called polkas. Muhu women folk dancers showing off both the dances and traditional costumes for which Muhu is noted. All dancers were women, and they wore costumes that are specifically identified with Muhu. Skirts were bright yellow with vertical stripes of varying colors. Our hosts said that, traditionally, there were more women’s dances because men were so often out to sea. • Making soap at GoodKaarma, an eco-farm on Saaremaa that makes organic soaps. 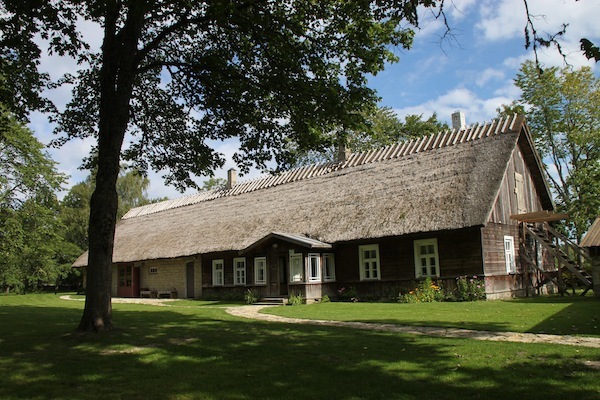 The house that accommodates the GoodKaarma soap factory, on the island of Saaremaa. 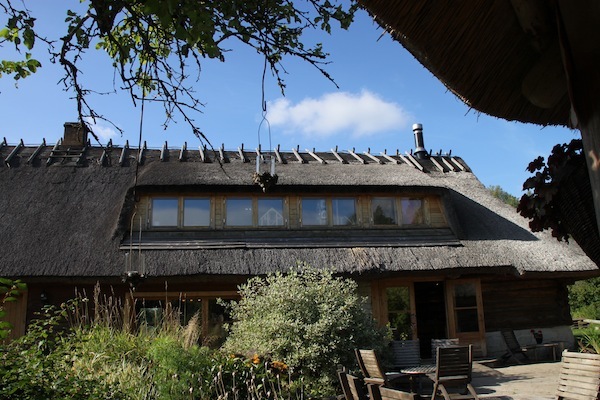 Co-owners Ea Velsvebel Greenwood and her husband remade an old house to accommodate their factory and themselves with children. She leads the soap-making sessions. 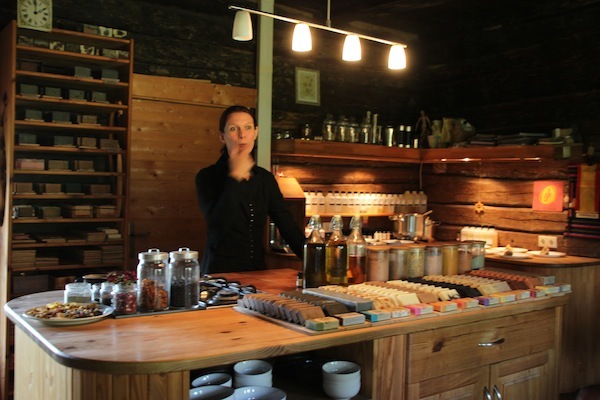 Ea Velsvebel Greenwood leading a soap-making workshop on the island of Saaremaa. For our group, this involved rebatching, meaning the shaping of new soap bars from the shavings left from making the soaps that GoodKaarma sells. We could add flowers and spices for scents of our choice. At GoodKaarma, soaps are based on olive, linseed and other oils, but no animal fat, which means the process does not involve stovetop cooking. Two workshop options are available in the summer, one at six and one at seven euros per adult, bookable through the GoodKaarma Web site. Our project was easy, and the factory certainly smelled nice!! • Touring Kuressaare, capital of Saaremaa County, which includes Saaremaa and Muhu islands. 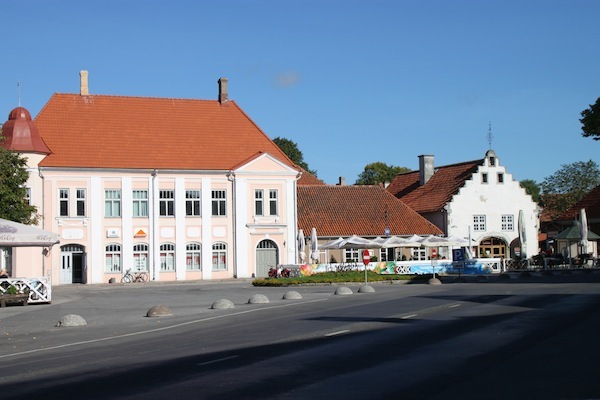 The central square in the town of Kuressaare on the island of Saaremaa. The town’s 17th century weighhouse is the white building at right. 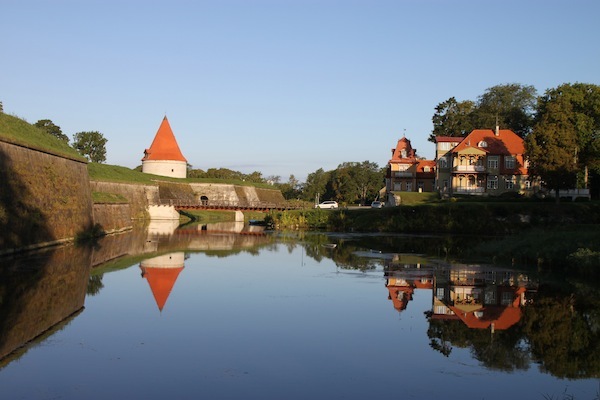 Kuressaare’s architectural centerpiece is a 14th century castle (with 13th century origins) and its water-filled moat. We also paused in front of a tavern called Veski located inside a windmill — where I had eaten a lunch 21 years earlier! The Saaremaa countryside is noted for windmills. 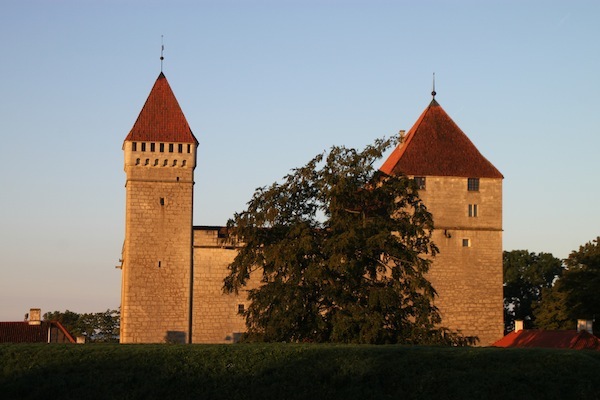 An early morning view of Saaremaa’s medieval castle. Our guide said Saaremaa has one traffic light, installed as a joke. However, while thinly populated, these islands are very connected. One can access free Wi-Fi almost anywhere in Estonia, including the islands. • And eating a lot of things made with sea-buckthorn berries. At breakfast, at a Kuressaare B&B called Ekesparre, my smoothie combined carrots, bananas and the berries. At lunch, after a spa treatment at Kuressaare’s Georg Ots hotel spa, lunch in the hotel’s restaurant ended with a sea-buckthorn sorbet. 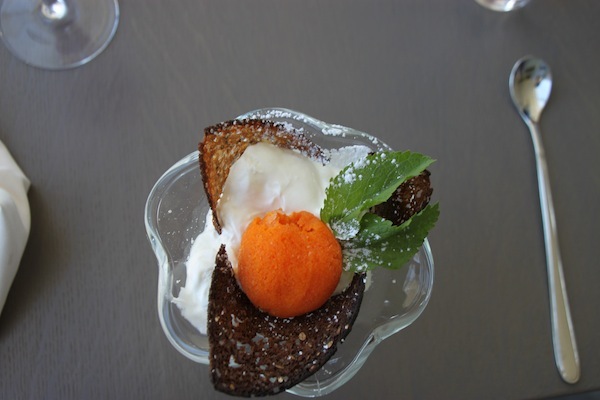 Sorbet, made with sea-buckthorn berries, served at the Georg Ots hotel restaurant in Kuressaare on Saaremaa. The yellow orange berries have a knack for thriving where other plants don’t such as in salty coastal areas, including Estonia’s islands. And, during a grand multicourse dinner at the luxurious Padaste Manor on Muhu island, we had a fish dish topped with a sea-buckthorn sauce and, later, another sea-buckthorn sorbet. 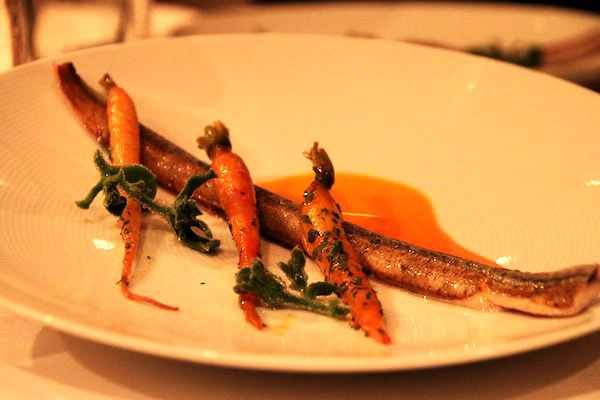 A course of needlefish and carrots, topped with sea-buckthorn sauce, served at the Alexander restaurant in the luxury Padaste Manor on Muhu island. The Padaste dinner was served in the former manor house, now the hotel’s main building. The restaurant, called Alexander, emphasizes Nordic cuisine; it has been voted Estonia’s best eatery for three years running. 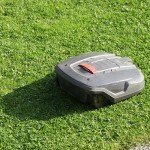 Robot lawnmower making its way, over and over again, across the lawns at the Padaste Manor on Muhu island. 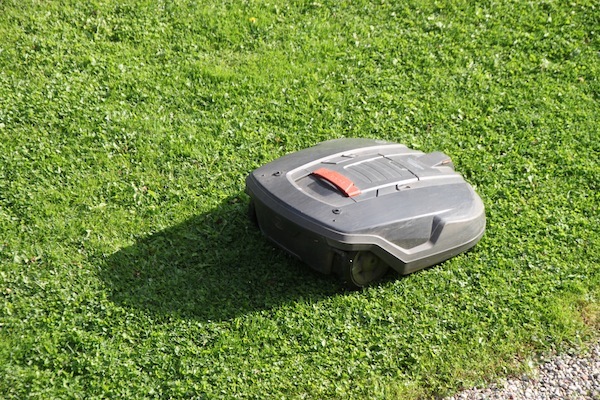 Aside from the expected luxury features, Padaste Manor amused us with something unique — a robot lawnmower. My room, in the carriage house, overlooked the lawns, where a robot busily mowed the grass endlessly, hence ensuring lawns were always in fine trim. This vision suggested (to me) a very large bug crawling across the ground, and I laughed a lot.